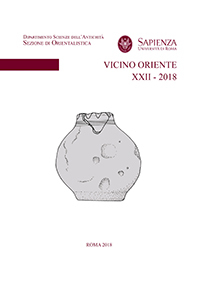 Vicino Oriente is the journal of the “Sezione di Orientalistica” (Section of Oriental Studies) of the Departments of Sciences of Antiquity and of Oriental Studies of Sapienza University of Rome. VO Journal is published yearly and deals with Near and Middle Eastern, and Egyptian ancient Art and Archaeology, History, and Epigraphy, extending its view on the whole Mediterranean and North Africa with the study of Prehistory and Phoenician and Punic documents. to introduce PhD projects currently undergoing in Sapienza University of Rome dealing with the main topics of the Journal. Papers submitted to the Editorial Board must be typed according to author guidelines and must be submitted through the appropriate e-mail address. Proposed papers are submitted to double-blind review and, when accepted, they are subjected to the editorial procedure according to the standard procedure reported at the page Peer Review.